Just north of Tiger Leaping Gorge at the edge of the Tibetan plateau sits the town of Zhongdian – recently renamed Shangri-La by the Chinese. It’s Tibetan name is Gyeltang, but no one uses it. Go figure. The name change was inspired by the James Hilton novel, The Lost Horizon, in hopes of spurring the tourist machine further north in the Yunnan Province. Unlike most Chinese cities which have been renamed to be more Chinese, this one is less so, but will surely sound better on a glossy brochure. 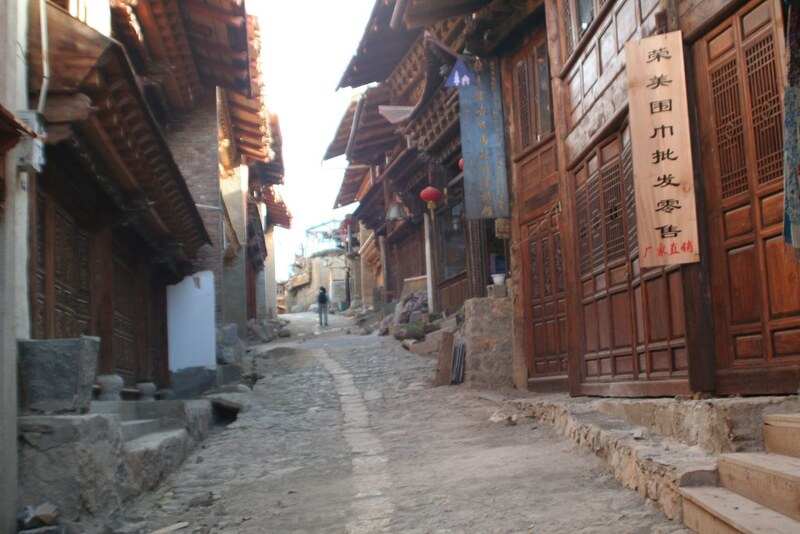 The Lonely Planet describes Zhongdian as “a bland Han Chinese town” and we couldn’t agree more. Most towns in China seem to be booming with construction. New stuff everywhere. Most of it not interesting or necessarily attractive. Once we were settled at a hostel, we set off to explore a bit of the Old Town. Sadly what we found was more new construction, apparently inspired by the success of the Lijiang Old Town. Not much old or Tibetan about it. Despite the tourist vibe, the Ganden Sumstelling Gompa outside of town was worth the visit and is apparently the most important in southwest China. And like most places we’ve visited, if you’re willing to hop on a bike you can explore interesting villages and scenery nearby. Unfortunately,the weather didn’t cooperate so we missed out on that experience. Zhongdian is mostly useful as a base for organizing an overland journey west to Lhasa or for heading north through the mountains into the Sichuan Province and the Kham region of the Tibetan plateau. We were planning the latter, so Zhongdian proved a fine place to camp out for a day or two. No, you won’t get much of a Tibetan vibe here, but you can get a darn good burrito! Thanks to Noah’s Cafe for that one.